iSNAP is a BYS photography comp which promotes young artists in the Northern Rivers of NSW, Australia. It's a continuation of SNAP!, an annual photography competition started by BYS in 2001. In 2017, the theme was STREET. Young people were encouraged to interpret the brief loosely. Images were judged on their originality, and ability to explore traditional street photography in a creative way. In 2018, the theme will be HOME. We are looking for original thought provoking photography. We believe photography is a powerful medium that young brings people together and helps them understand the world at large. In 2017 the competition was facilitated by Byron-born-and-bred photographic artist Yani Clarke. The iSNAP photography competition was open to all young people aged between 12—18 years in celebration of National Youth Week. Successful entrants were exhibited at The Byron Flea Market (theYAC), Tully's Cafe, & Byron Bay Brewery. In 2017, we had special guest judges, Craig Parry & Francisco Tavoni, on the panel. 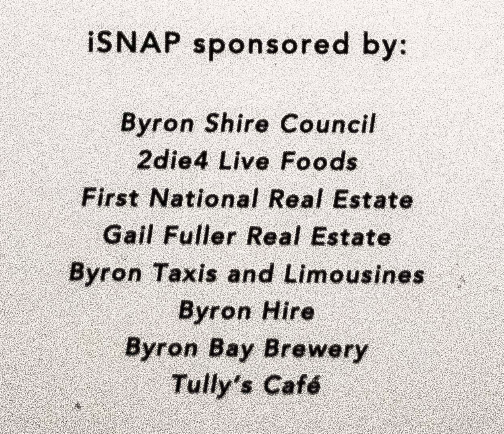 iSNAP is a BYS run, Byron Shire Council sponsored National Youth Week celebration.